Although I have already written more about gun ownership statistics than I care to (here and here and here and here), the questions of who owns how many guns and how we know are important. So I took note when sociologist Dan Hirschman posted today on the scatterplot blog that the data for the 2016 edition of the biennial General Social Survey is now publicly available. Hirschman also linked to the GSS Data Explorer trends page which allows users to quickly look at basic trends on issues of interest. 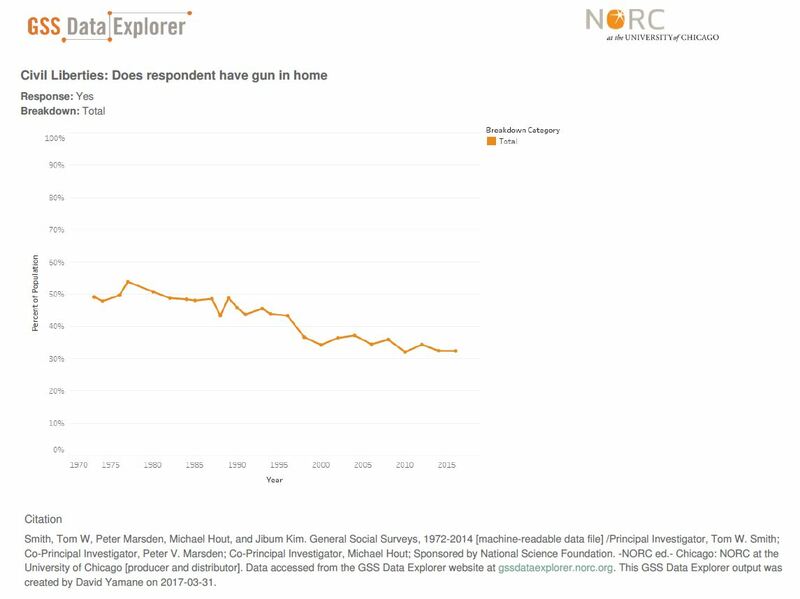 As in 2014, the GSS finds 32% of American households have guns, roughly the same rate as the GSS has found through the 2000s. The GSS Data Explorer also makes it easy to look at rates of HGO for subpopulations, like men and women, and by political party. Note the 32% aggregate HGO combines 36% of males who say they have a gun in the home and 30% of females, who are known to underreport household gun ownership. Even if no men underreported HGO (which they certain do), the actual HGO is almost certainly higher than 32%. With respect to political affiliation, the 32% aggregate combines the 24% of Democrats, 31% of Independents, and 48% of Republicans who claim guns in their homes. Regardless of the specific percentages, the relative ranking of these three groups makes sense. Of note is the 5% drop in Republican HGO from 2014 (53%) to 2016 (48%). Could this be a “Oh Crap Hilary Clinton is Going to Be the President” false negative effect? One indicator of false negatives is the refusal to answer a gun ownership question. 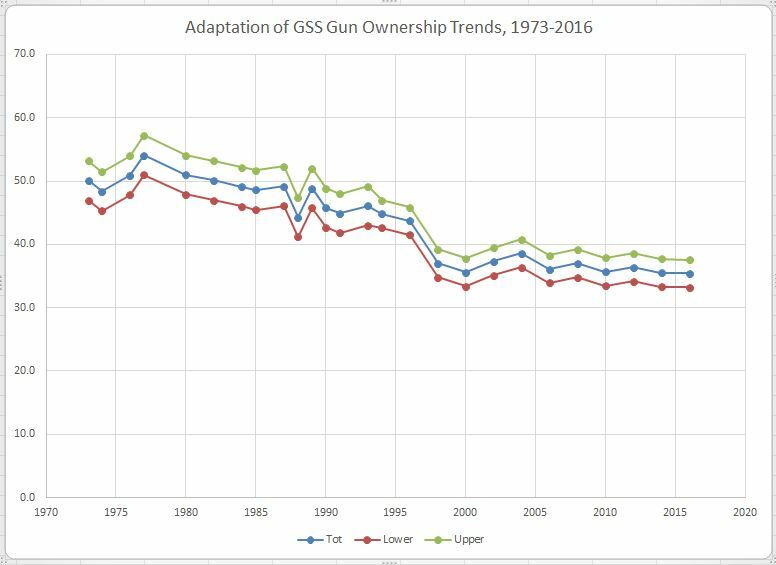 The percentage of individuals who refuse to answer the GSS gun ownership question has doubled and tripled in recent years. For most of the 1980s, it was less than 1.0%, but it grew to 3.6% in 2010, 3.1% in 2014, and 3.0% in 2016. If we add the refusals to the GSS HGO estimate, and also take into consideration the margin of error due to sampling variation (which has ranged from +/- 2.2 to +/- 3.1 for the 95% confidence interval over the years of the GSS), we get a chart that looks like the one Sandra Stroud Yamane generated in Excel. Tot = GSS estimate plus refused to answer. Lower = Tot minus margin of error. Upper = Tot plus margin of error. 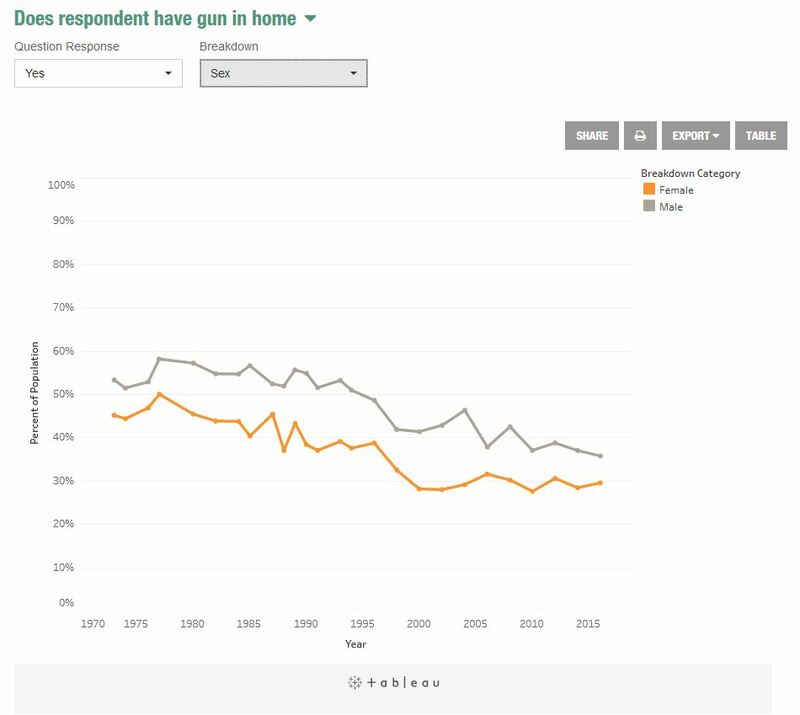 It is interesting to observe that the upper estimate for 1994 is the same as the lower bound for 1973 (47%), essentially suggesting stability in household gun ownership. 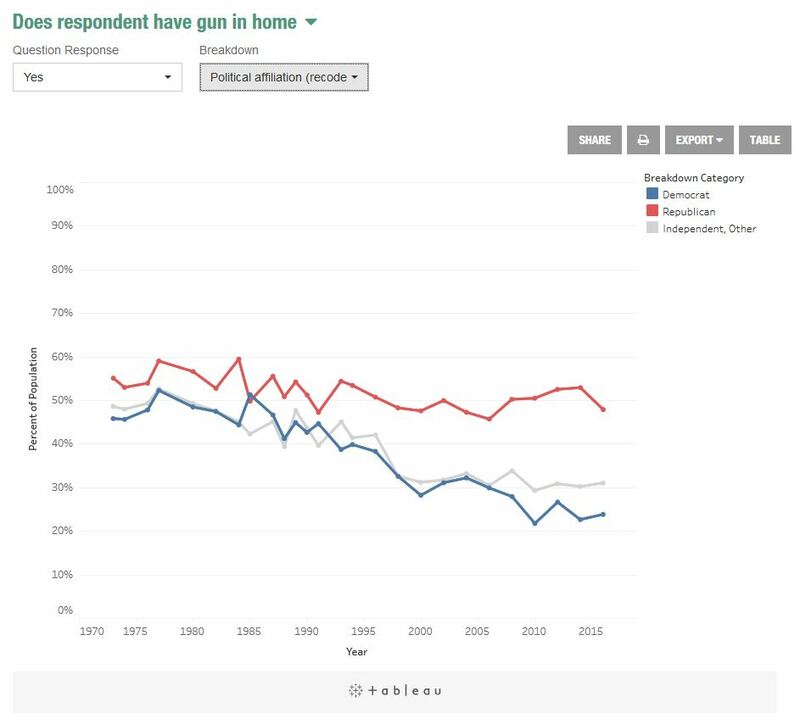 And then there is a significant drop after 1994 — Clinton assault weapon ban and Brady Bill raising concerns about gun ownership — which stabilizes from 1998 forward, such that the rate of household gun ownership appears stable in the GSS from 1998 to 2016. (B) If false negatives are growing post-Clinton/1994, then the rate of household gun ownership in America is not only stable and higher than the GSS estimate, but also growing. 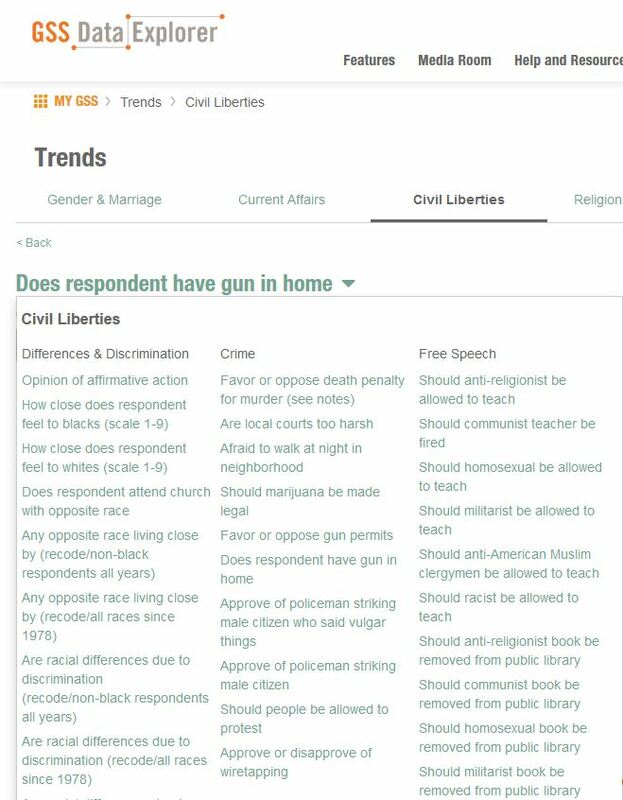 Tags: Data, General Social Survey, gun owners, Gun Ownership. Bookmark the permalink. I agree, it’s almost certainly under-reported – looking at compliance figures for mandatory firearms registration in NY, CT and elsewhere provide enough evidence to convince even the most skeptical.